This family of 4G LTE-enabled Android handsets powered by Intel processors starts at $160 USD in Taiwan and will reach the United States market in the coming months. Asus announced the Intel-powered Zenfone 2 family of smartphones back at CES 2015 and now they finally go on sale. The first country to receive them is Taiwan, where the available models range between $160 USD and $290 USD, offering very good value. All available models come with 4G LTE, dual SIM capability, and microSD card slot. One of the cheapest models is ZE550CL, powered by a 1.6 GHz Intel Atom Z2560 SoC. It has 2 GB RAM, 16 GB internal storage, 720p 5.5-inch display, 2 MP front and 8 MP back camera, as well as a 2,500 mAh battery. The device with the highest specs is labeled ZE551ML and uses a 2.3 GHz Intel Atom Z3580 SoC. Its other features include 4 GB RAM, 64 GB internal storage, 1080p 5.5-inch display, 5 MP front and 13 MP back camera, all fed by a 3,000 mAh battery. 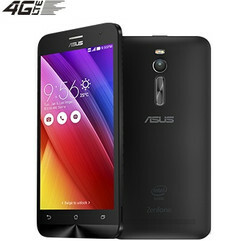 All Asus Zenfone 2 devices come loaded with Android 5.0 Lollipop and can be purchased from main Taiwanese carriers, as well as from Asus' local online store. Launch events for various other markets are planned for the coming months, the United States included. We will get back with details as soon as the Asus Zenfone 2 gets there.